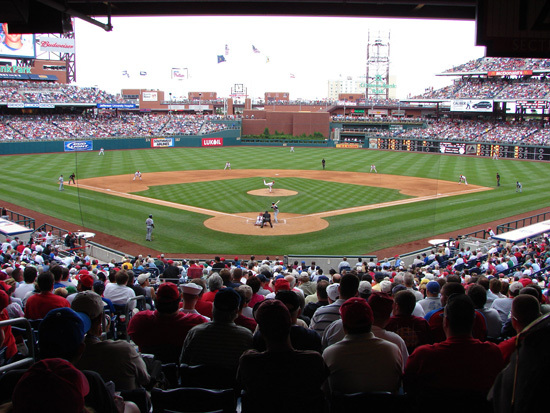 The Philadelphia Phillies, a National League team, play at Citizens Bank Park, which was built in 2004, seats 43,500. 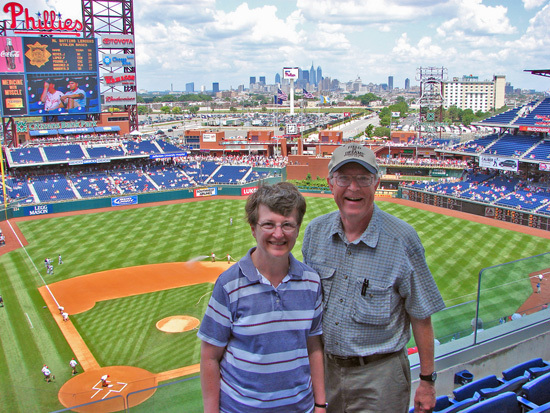 We returned to Philadelphia to see a game at the new ballpark. 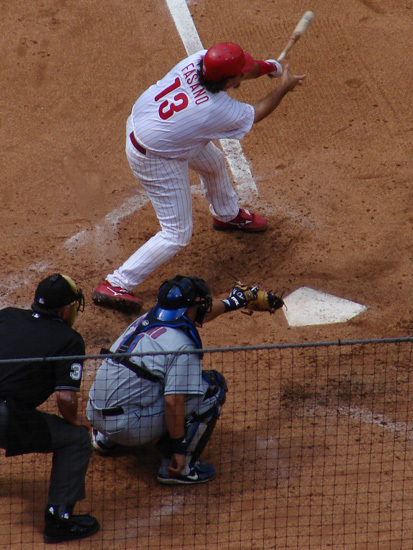 The game started at 1:05 pm. 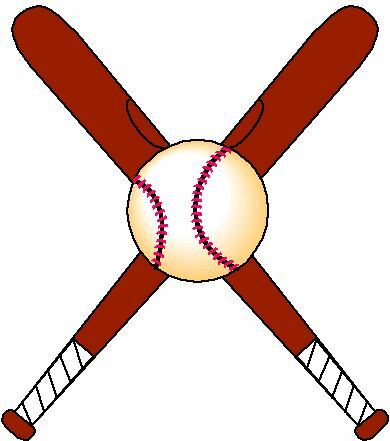 Jim thought it was a night game, but our friend Ed told us it was a day game against the New York Mets, his favorite team. 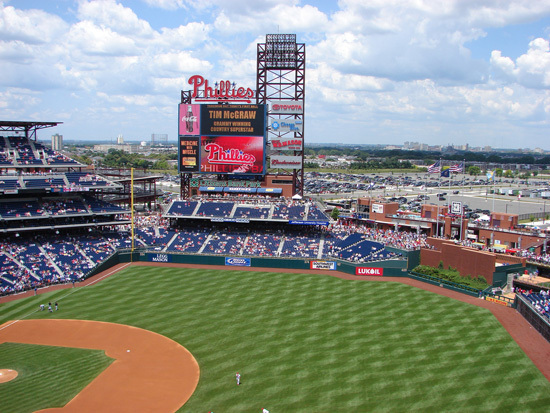 We checked into our motel early and headed for the ballpark. It was a very warm sunny day, but there was a nice breeze blowing which helped keep us cool. 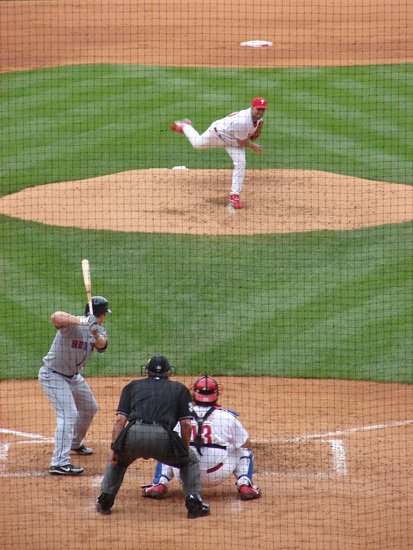 A heavy rain shower stopped the game for 23 minutes in the third inning. 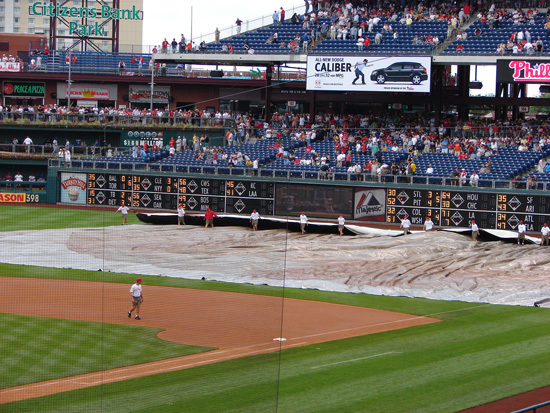 The crew barely got the tarp on the field before it stopped raining and they had to take it off again. 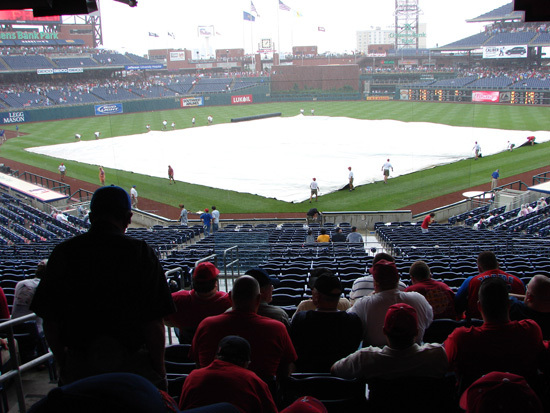 The rain was heavy enough that almost everyone ran for cover in the concourse areas. 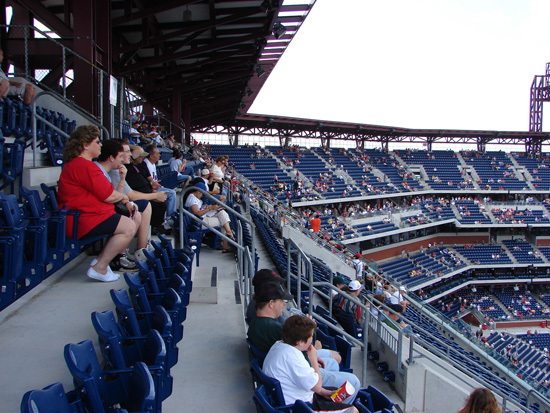 With the breeze the seats and stands dried out quickly. 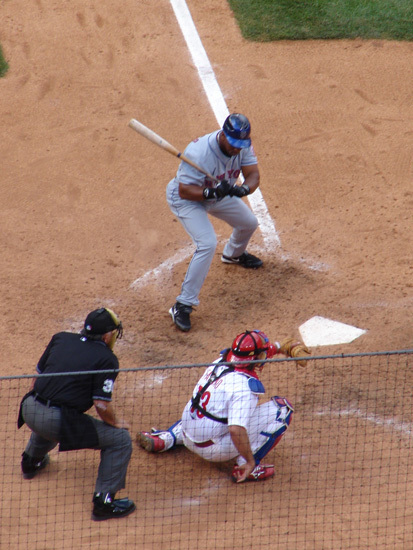 There were many Mets fans in attendance and they were happy to see the Mets win 5 to 4. 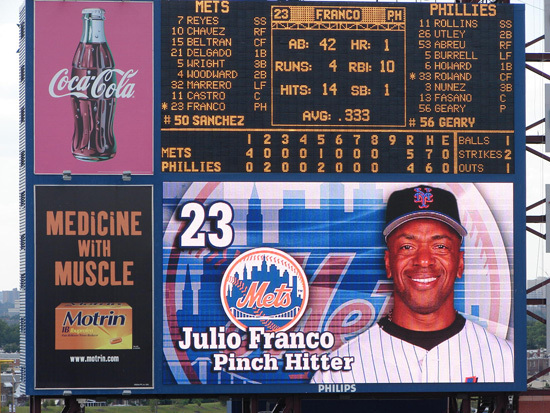 At the time of the game the Mets were leading the Eastern Division over the Phillies. 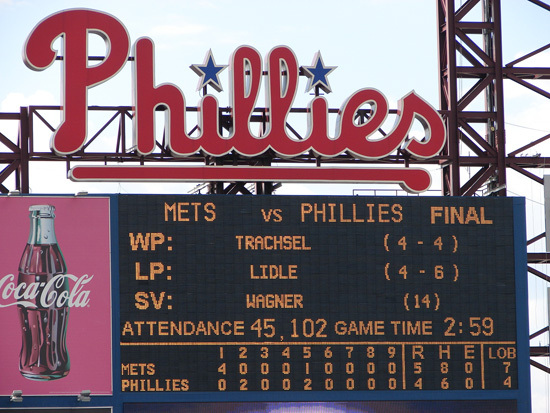 The box score was Mets R-5, H-8, E-0 and Phillies R-4, H-6, E-0. 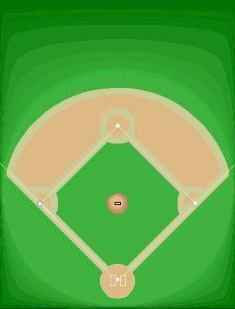 The field lines are RF-330', RC-348', CF-401'-409', LC-387'-374', LF-334'-329'. Great variety of food. 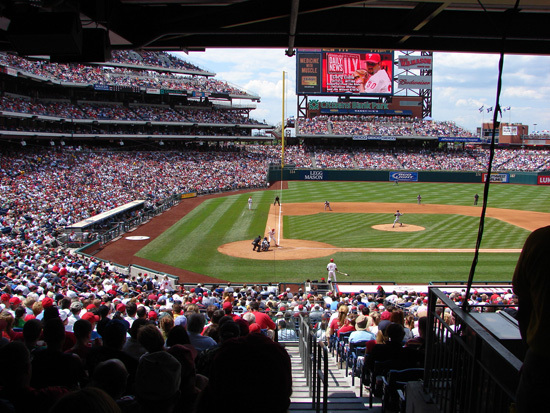 Ashburn Alley out in right field has the specialty foods. 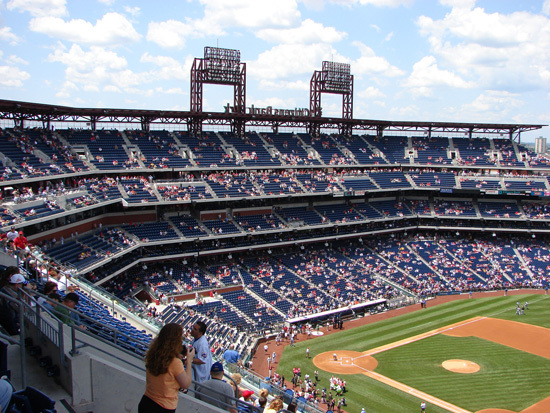 Tickets are not cheap. 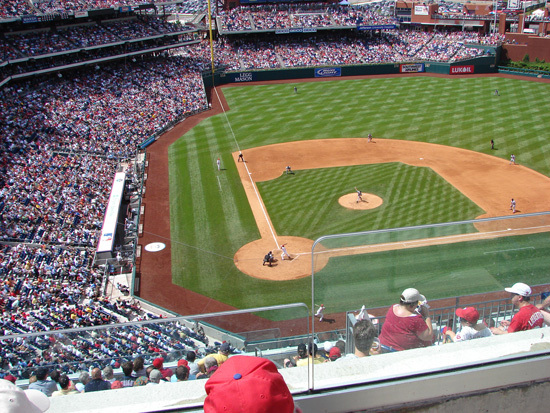 The cheapest are the Pavilion Deck, the Terrace Deck, the Rooftop Bleachers in right center above Ashburn Alley at $15. 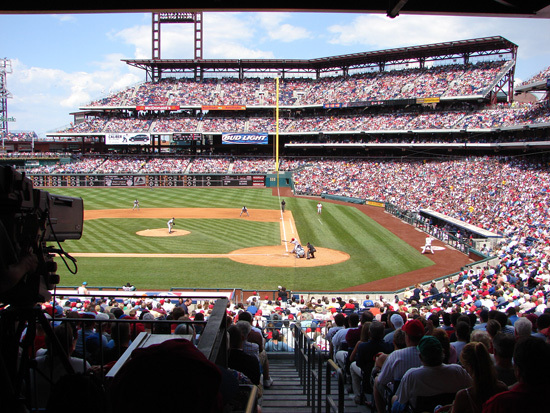 Between mid-May and mid-August depending on your seat location you pay an additional $1-$3 extra per seat, except the Rooftop Bleachers which stay $15. 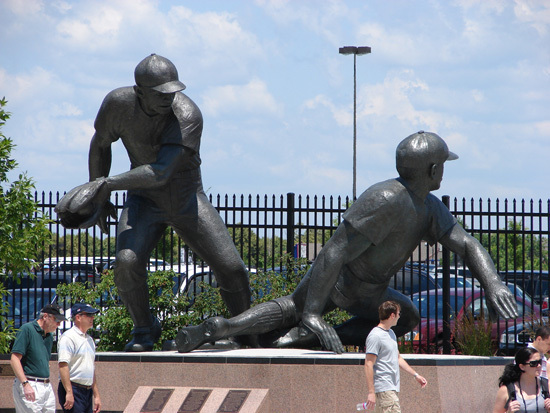 The statue was outside Veterans Stadium and is now next to a parking lot across the street from the ballpark. 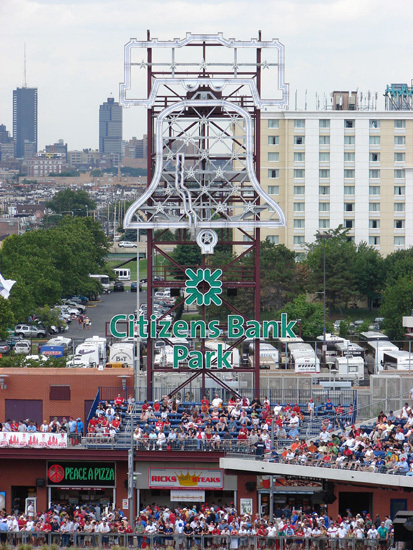 The mascot is the Phillies Phanatic who is standing behind the stadium announcer. 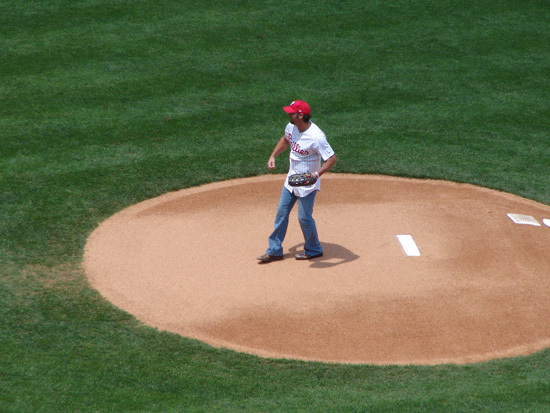 He reads the line-up from behind home plate before the game. 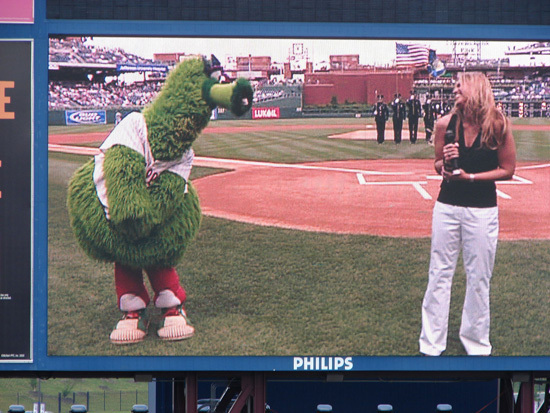 The Phanatic flirted with the woman who sang the National Anthem. 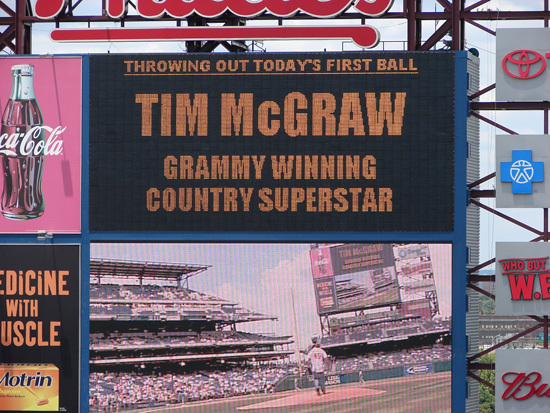 Tim McGraw threw out the first pitch. He was singing at an adjacent venue the same evening. 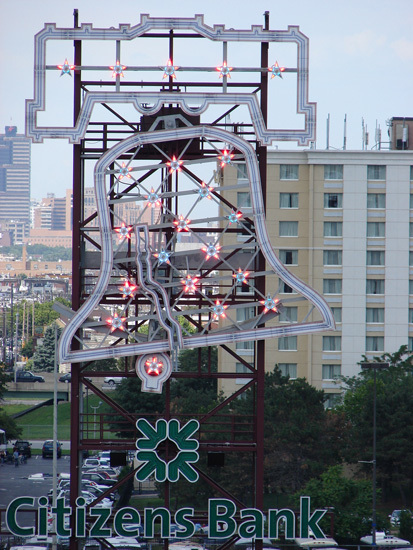 When a Phillies player hits a home run the Liberty Bell moves back and forth and red, white, and blue lights flash. 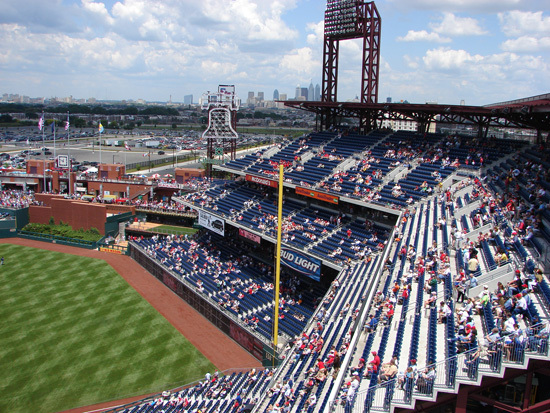 From the upper level you can see the Philadelphia skyline in the distance. 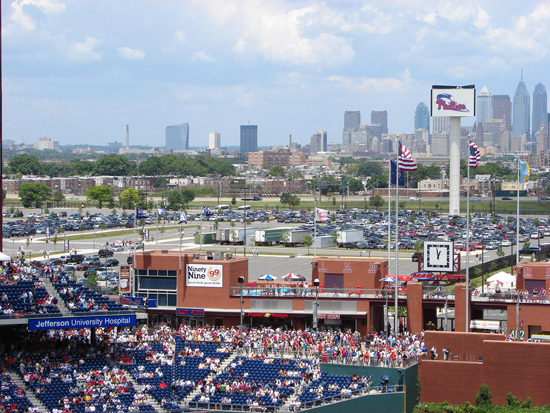 The foreground view of south Philadelphia is not too attractive. 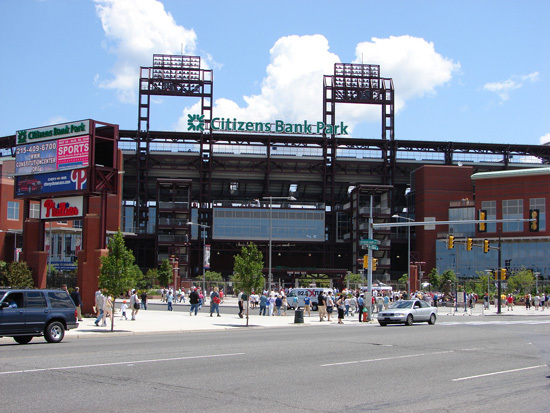 Lots of parking close to the ballpark. We paid $10 which appeared to be the standard fee.